Recently I was reading about the flooding in Louisiana (which is now considered the worst US disaster since Hurricane Sandy), and it occurred to me that my site doesn’t have a single article about how to deal with floods. 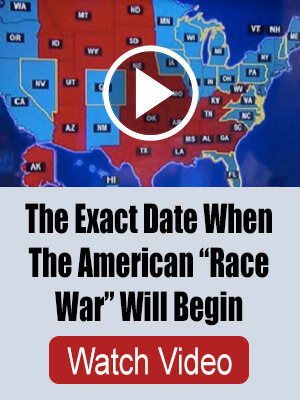 Well, I’m fixing that right now. 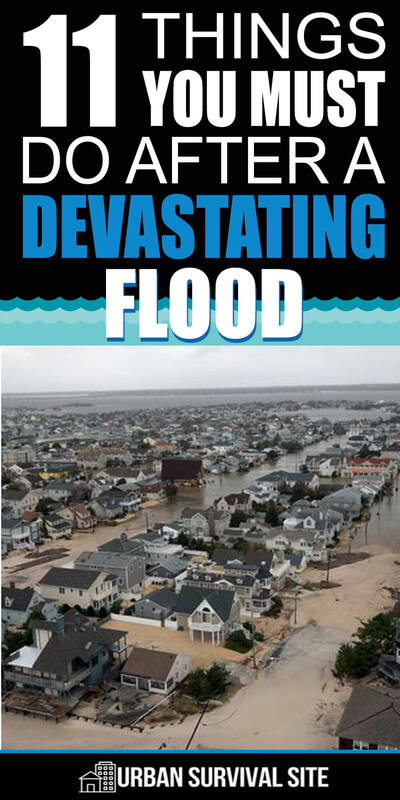 There are bound to be plenty more disastrous floods in the future, so if you live in or near a flood zone, you need to know what to do. Floods are unlike any other natural disaster. They tend to linger for days or weeks while other natural disasters are over and done within a matter of minutes. You will typically get a warning of a flood unless it’s a flash flood; but even then, heavy rain is a good sign that there will be some flooding. Unfortunately, many people don’t take floods very seriously. It’s just a little water, right? That attitude is why many people have died needlessly. 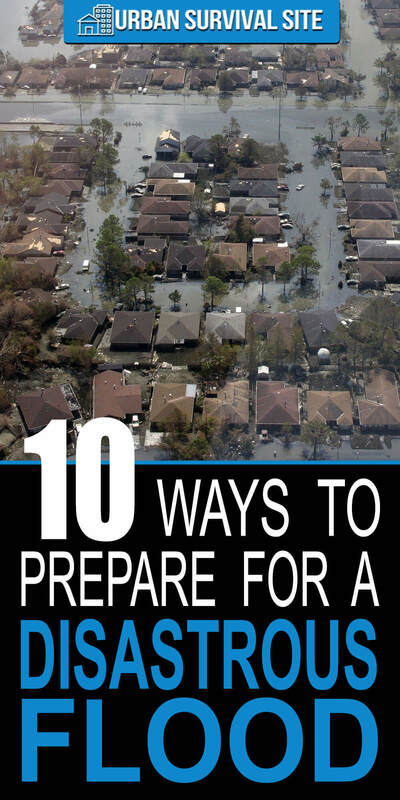 To make sure you and your family are able to survive not only a flood, but also the chaos in the days after the waters roll in, there are 10 things you need to do. This will provide you with the local flood maps for your area. Reference the key and check local bodies of water to determine whether you live in an area that is at a higher risk for flood. You can check with city hall as well. Most people don’t realize standard homeowner’s insurance doesn’t include coverage for flooding. Take additional precautions to safeguard your home. 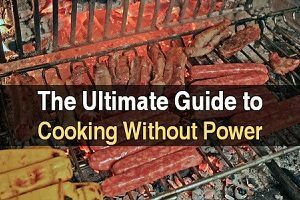 This includes having electrical outlets installed at least 12 inches off the ground, placing the water heater on blocks to keep it above the water, and anchoring any propane tanks you might have on the property. Make sure you have enough food, water, and basic necessities for your family to last at least three days. That is the bare minimum. (See the list of supplies below.) Flood waters can take weeks to recede. And depending on the size of the flood, it can take several days for aid to reach an area. The best option is to get to higher ground. Know which roads will get you out of the flood zone the fastest. Be prepared to leave on foot should the roads become clogged with other fleeing residents (in which case, you should have some bug out bags). Buy a local map, mark various evacuations routes, and practice your flood evacuation plans with the family. Don’t forget to include your pets in your evacuation plans. Store important documents like deeds, passports, birth certificates, insurance policy information, and so on in a sealed bag inside a waterproof case. Better yet, put together a grab and go binder and take it with you when you evacuate. This is especially true for food storage. Six inches is the bare minimum. If there’s only a minor flood, the waters won’t reach your supplies. Brace the shelving to keep it in place when the flood waters pour in. 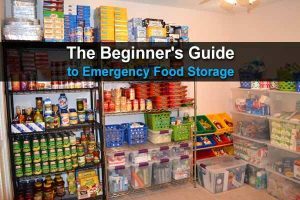 Identify places in your house that will serve as a temporary shelter should you not be able to evacuate, and keep most of your supplies there. The second story of your home is your best bet. You should also have a way to get onto the roof, just in case. Find and label these right away. When you know a flood is imminent, shut everything off. This will make your flooded home a little safer for you and the folks doing search and rescue missions. If you think your home could be at risk for flooding, get a sump pump. This can save your home by pumping the water out of your house and preventing the water level from becoming higher than a few inches. Every little bit helps. If a flood watch is issued, bring in patio furniture or secure it to your deck. You don’t want to create more hazards in the water if you don’t have to. This also ensures your property will stay where it belongs. 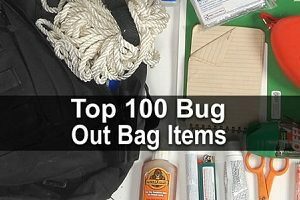 This is a list of some of the basic supplies you will want to have on hand at all times. Store these items in 5-gallon food safe buckets. This will protect them from the water should the flood waters be deep enough to reach the buckets on your shelves. 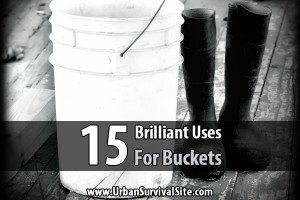 Buckets are also easier to grab and take with you in case you have to head to the second floor or evacuate. Vehicle Survival Kit (in case you don’t reach your destination and have to shelter in your car for a few days. Staying safe when the initial flood waters start rolling in is your first priority. The flood waters may rise slowly, or they may rush in, giving you very little time to react. The key is to get out of the water. Remember, it is never just water. Strong currents and debris make it far more dangerous than water you would find in a lake or stream. If you can safely drive out of the flooding area, do so. Never attempt to drive through standing water. You don’t know how deep it is, and you could find yourself trapped in a sinking car (see the video below). If you are evacuating on foot, the rule to follow is any water levels higher than your ankles should be avoided. It only takes a few inches of water with a strong current to knock you off your feet. DO NOT risk getting trapped in your car. Once the water gets too high, the pressure will make it impossible to open the door, so get out before that happens. Climbing a tree, getting on top of a house, or wrapping your arms tightly around a pole is better than staying in a car. It takes less than 2 feet of water to whisk a car away. In the video below, this woman nearly drowns because she stayed in her car too long. As I already mentioned, the water will be filled with debris that can hurt you. Logs, shards of glass, bits and pieces of houses, and anything else that has been caught in the path of the flood waters will be moving along with the current. Downed power lines are a huge concern during a flood. If you see power lines in the water, stay far away to ensure you are not electrocuted. If you have been caught up in the flood waters, keep your mouth closed to avoid swallowing the water. It will be filled with chemicals, debris that could actually choke you, and even raw sewage. Spray “SOS” in huge letters on the roof and/or outside walls of your house. This will catch the eye of any search and rescue workers who are driving by or flying over the area. Water from the tap will likely contaminated with chemicals and sewage. Stick with your bottled water (or a water purifier that can kill viruses) until the public water system has been given the all clear. Even if everything looks okay, water can lurk behind the walls and wiring may have been damaged in the flood. You’ll want to have plenty of pictures for insurance purposes. There is likely to be a long wait for claims to be processed. Anything you can do to speed up the process will help. If you have your cell phone, use it to check in with friends / family to let them know you’re okay. If you can safely get to a Red Cross shelter, you can sign in with them and put your name on the safe list for family members outside of the area to check. An area that is hit hard by disaster is prime feeding grounds for bad guys willing to prey on the victims of a disaster. You may need to defend yourself and your property from those who try to take it. Be prepared to survive a home invasion. If your area has been issued a flood watch, pay attention to what is happening and stay tuned to the radio. Nowadays, alerts are sent directly to your cell phone so no matter where you are, you will know things are about to get ugly. If you are ordered to evacuate, follow the guidelines. Trying to ride out a flood doesn’t just put your life in jeopardy, it jeopardizes the lives of the people who have to come and save you.